Our team can take care of the air conditioner installation process for you with efficiency and professionalism in Cornelius, NC. Replacing your old air conditioner is beneficial for many different reasons. For example, when you update your system, you’ll be able to save money on your utility bills when the temperature outside starts to rise. 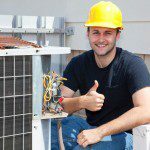 However, in order to fully benefit from using a new air conditioner, it’s essential that the air conditioner installation process is handled with care. Once we finish the air conditioner installation process, our assistance doesn’t have to end there. If you ever run into a problem with your air conditioner after it’s installed or you want to ensure that it is working as efficiently as possible, we’ll be there to meet all of your repair and maintenance needs. Remember, when it comes to the air conditioner installation process, it’s always best to leave the job up to our team of professionals. To schedule a time for us to provide you with service or to find out more about what makes our team stand out, give us a call today. At Cool Comfort Heating & Air, we provide high-quality air conditioner installation services in Mooresville, Huntersville, Cornelius, Lake Norman, Denver, Troutman, and Davidson, North Carolina.